Nothing compares to these open-back gowns for ease of dressing. These men's gowns have a six inch overlap for modesty and have two metal snap closures at the neck. Made of poly/cotton broadcloth, these gowns are perfect for every day use. Short sleeve. 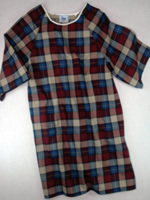 Available in assorted plaids and prints. Machine washable and dryable. Men's sizes S - 3X. For sizing, use the measurement of the waist. Made in the USA.